FRANCE The vineyards of Bordeaux are probably best known for the fine wines they produce, but with grape marc, the residue produced in the wine-making process, being used to make biofuel, transport operator Citram Aquitaine is running a bioethanol-driven Euro VI Scania Interlink LD between Bordeaux and Blaye. Citram Aquitaine is a transport operator for our times, says Scania, as it’s committed to sustainable methods of energy consumption. 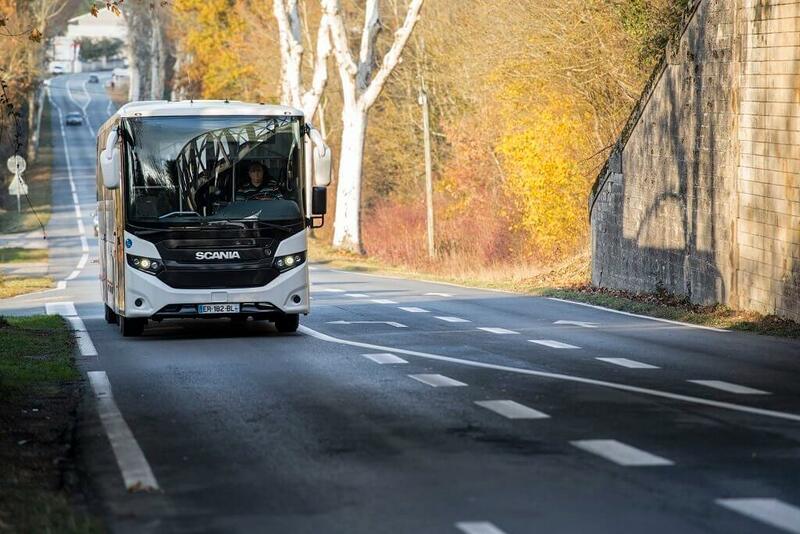 In an experimental bid to move away from fossil-reliant transport, it is testing the bus on intercity route 201, the ED95 fuel powering it being supplied by Raisinor France Alcools. The message ‘I run on bioethanol produced from grape marc’ is written down the side of the vehicle. “We have to be at the forefront of innovation,” said Nicolas Raud, Director of Citram Aquitaine. “I believe that the ability of a carrier to reconsider its energy mix is essential. The collaboration between Scania and Citram is enabled by the key contribution of Raisinor France Alcools, which supplies the biofuel required to run the experiment. Raisinor has brought together the French wine cooperatives, with Union Coopératives Vinicoles d’Aquitaine (UCVA) producing 100,000 tonnes of grape marc every year on its site at Coutras in the Gironde department. “Their production potential would supply 1,000 vehicles locally,” said Jérôme Budua, Director of Raisinor France Alcools. “We are responsible for 80% of intercity operations in Gironde,” Nicolas continued. “This covers 42 routes, some of which play a pivotal role in the network, completing up to 19 return journeys a day. Scania says a vehicle running on ED95 consumes more because the energy output of ethanol is half that of diesel, and it is more expensive to buy compared with a diesel vehicle. “To cause less pollution, we must accept the bill,” said Nicolas. “Reappraising our fleet of vehicles by investing in alternative energy can only be done with the support of the region, and we know that the region views this approach favourably. “It is up to us to suggest an economically acceptable energy mix. “Bioethanol and gas allow us to develop an energy mix that is suitable for our area. In our network, some remote places do not have and probably will never have a petrol station with gas.